and now introducing the 5th member.. It was just unveiled at the Chicago Auto Show. The top-selling crossover in the U.S. is gaining a wild side. Toyota unveiled the 2020 RAV4 TRD Off-Road, an adventurous version of its compact SUV, at the 2019 Chicago Auto Show on Thursday. 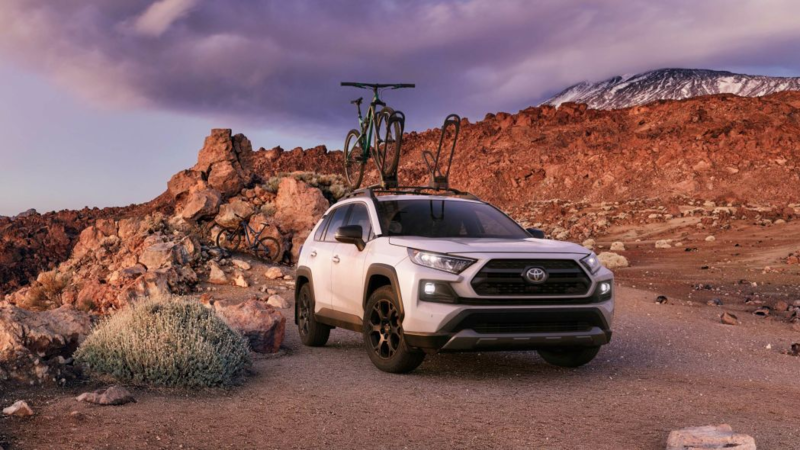 The 2020 RAV4 TRD Off-Road is the latest addition to Toyota’s stable of vehicles enhanced by its performance division known as TRD, or Toyota Racing Development. 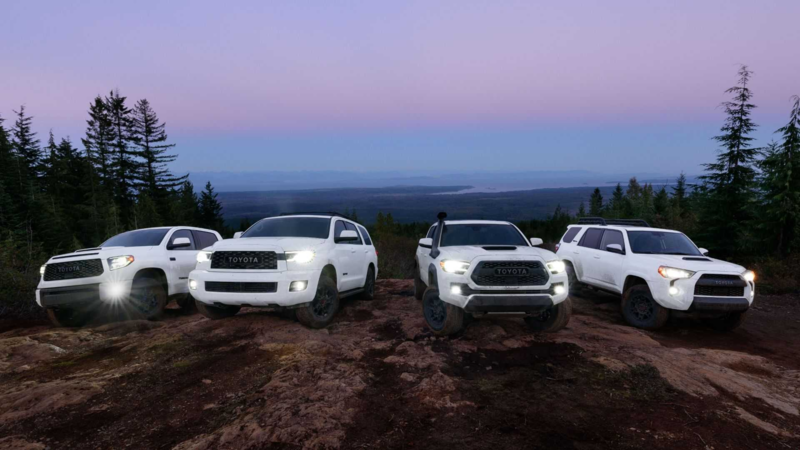 The automaker also introduced the Sequoia TRD Pro SUV and an updated Tacoma TRD Pro pickup in Chicago. The RAV4 TRD Off-Road is powered by the same powertrain as the standard RAV4 that debuted in 2018. It features a 2.5-liter four-cylinder engine with 203 horsepower and 184 pound-feet of torque paired with an eight-speed automatic transmission. The RAV4 Off-Road will feature standard all-wheel drive, all-terrain tires and off-road suspension. It also shares an assortment of parts with the RAV4 Adventure trim, such as standard roof rails and oversized fenders. The bumpers, front grille and fog lights are similar as well. Both the RAV4 Adventure and TRD Off-Road have several driving modes to choose from, depending on terrain. The TRD Off-Road sets itself apart with its suspension. It has red coil springs and updated shocks prepped to venture onto dirt trails. It is also tuned to maximize wheel travel and improve control when the roads get rough. Toyota included the same Multi-Terrain Select system currently in the RAV4 that allows drivers to choose between several modes such as Snow, Mud and Sand, or Rock and Dirt. But the TRD Off-Road also comes with hill-start assist and hill-descent control for steep grades. Trailer Sway Control is included for enhanced safety while towing. The RAV4 TRD Off-Road has a maximum towing capacity of 3,500 pounds. Inside, the new model features red trim and stitching to set it apart from standard RAV4 models. Seating surfaces are made of a light, durable material called SofTex. TRD branding is included on the headrests, floor mats and rear cargo mat. The exterior of the vehicle is marked by matte black 18-inch wheels that are lighter and more rigid than other RAV4s. The wheels are wrapped with Falken Wildpeak A/T Trail tires for an aggressive look. The RAV4 TRD Off-Road comes in five colors, including a two-tone metallic gray with a white roof that is exclusive to the model. The automaker’s suite of advanced safety technology known as Toyota Safety Sense, or TSS 2.0, is included as standard. The RAV4 TRD Off-Road arrives as consumer demand for light trucks – a category that includes crossovers, SUVs and pickup trucks – continues to grow. Light trucks accounted for 68 percent of all vehicle sales in 2018, up from 63 percent in 2017. Sales of the RAV4 increased by 4.8 percent from 408,000 units in 2017 to 427,000 last year, making it the top-selling vehicle in the U.S. that is not a full-size pickup truck. The 2020 Toyota RAV4 TRD Off-Road will go on sale this fall. Here's a video of the display at the Chicago Auto Show. This guy is good...IMO he's almost as thorough in his static-reviews as King Alex (Dykes). This is going to be a big mark up on this Rav4 They already have a trail edition, so why not a TRD Pro? Last edited by LexsCTJill; 02-08-19 at 05:16 PM. This is going to be a big market on this Rav4 They already have a trail edition, so why not a TRD Pro? Agreed, but one thing about a version of the RAV-4 like this concerns me. Toyota basically seems to be doing, to the RAV-4 TRD, what Jeep did with the Compass and Patriot...add or substitute some hardware, stick a colorful decal or Trail-Rated badge on it, and turn it loose, off road, with Crocodile-Dundee-wannabes. I'm sure the TRD Pro version will be able to do a LOT more than just suburban grocery-shopping...it will probably be at least reasonably competent off-road, so I'm not questioning that part of it. But, sometimes, those Trail-Rated and Off-Road badges can be misleading. As with the Compass and Patriot, because of their basic structures, almost nothing you can do to a RAV-4 is going to turn it into a true Jeep Wrangler competitor. That means that some owners, ignorant of the true capability of the vehicle, are likely to be over-zealous off-road, and either wind up in a situation they (or the vehicle) can't handle, or possibly damage the vehicle itself. Its just marketing. Most people recognize that it's just marketing. Consumer appeal shifts, which is why Toyota has gone to this style of marketing, they have big big mark ups. We have two SUVs, do either go off road? NOPE. They are for utility and bad weather with the occasional very rare trailer pull. This is the case for 98% off the buyers. If it was in my budget I'd like to replace my '99 4Runner Highlander/Sport someday with a 5th gen 4Runner and it would be used as intended including towing and off roading and would be a great camping vehicle. This is my first time without a truck in over 20 years. To be clear, the RAV4 is NOT a TRD Pro. It's a TRD Off-Road, which in the tiers of Toyota grades, is lesser than the TRD Pro. TRD Off-Road gets minor enhancements, here, the TRD tuned springs and shocks, over the Adventure grade, and some additional interior design elements. Not sure how much of a premium they'll try to charge for the TRD Off-Road over the Adventure model. Last edited by pbm317; 02-11-19 at 03:22 AM. If this were a TRD Pro, then yes, I'd say Toyota is cheapening what it is to be a TRD Pro, but it's not. It's the simpler TRD Off-Road level of naming. So in that sense, I think this application and execution is fitting. It at least gets some TRD parts (mainly shocks/springs) but they're not the level of TRD Pro which have the Fox Bypass Shocks and substantial lift, etc. OP: Do you have all of those TRD variations?